The Paris Feast: Sebastien Gaudard : The Parisian chic high-end tea room. Sebastien Gaudard : The Parisian chic high-end tea room. A friend once told me that the only Parisian thing she misses when she travels to a foreign city is the French patisserie. So this time let me take you to one of those numerous spots where you can savor the rich taste of French sweetness. When on a visit to Paris, you are sure to drop in at the Louvre, and then may take a walk in the beautiful Tuileries gardens facing the pyramid of the Louvre. 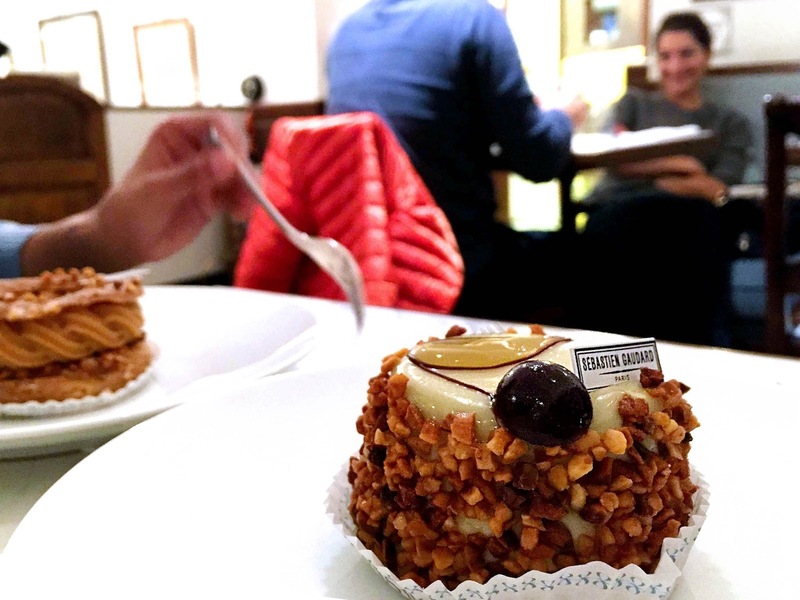 Just then if you happen to crave for some French desserts, one of the best places to taste them is just around the corner. 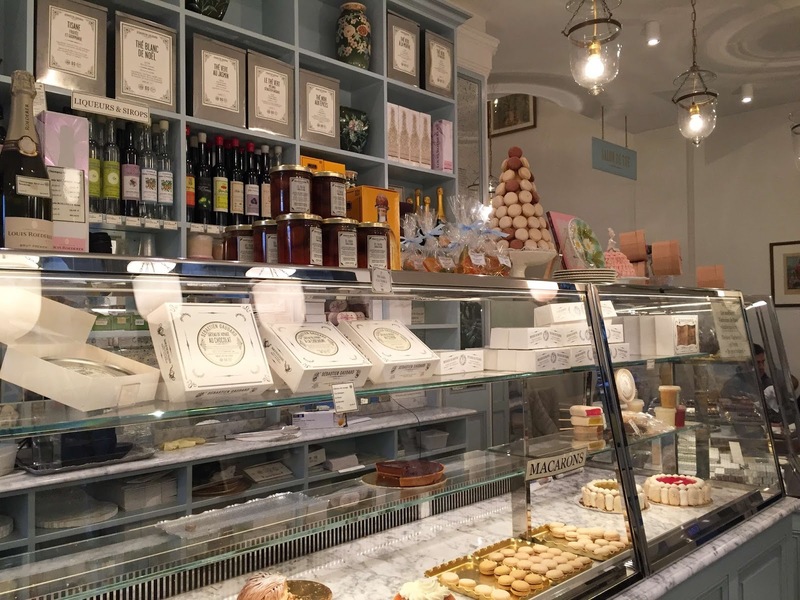 You can surely drop in at Sebastien Gaudard, the luxury tea room located at 1, Rue des Pyramides, just beside the golden statue of Joan of Arc on the iconic Rue de Rivoli. The tea room was opened exactly 3 years ago in November, 2014. However its founder has a profound and enriching career behind him and is also one of the best known pâtissiers (pastry chef) of France. In fact, this may be the first tea room of Sebastien Gaudard but his pastries were available at his patisserie on Rue des Martyrs in the 9 arrondissement since 2011. So first a little bit about the chef Sebastien Gaudard. The Chef : Sebastien Gaudard inherited the talent of pastry making from his father Daniel Gaudard who had a patisserie at Pont-à-Mousson, in the Lorraine region of north-east France. The son after successful trainings with renowned chefs in Mulhouse and Audincourt came to Paris where just at the age of 22, he became the pastry chef of the Hôtel Matignon, the official residence of the Prime Minister of France. In 1993, he joined the reputed tea room Fauchon of Paris as the second to Pierre Hermé (check my blog about the later). There he succeeded Pierre Hermé as the chief chef of Fauchon at the age of 26 in 1996. As I mentioned above he launched his own patisserie range since 2011 and was awarded the best patissier of France in 2012 by the renowned gastronomic critic Gilles Pudlowski. 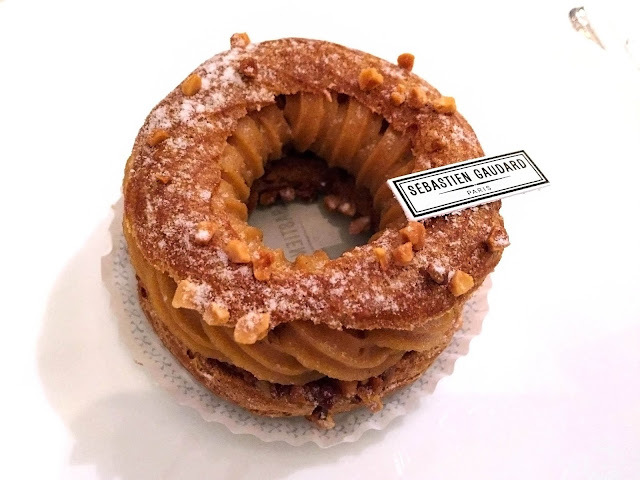 Through his brand Sebastien Gaudard, the son continues the experience of one of the best pastry chefs of France, as well as the traditions and know-hows which his father started since 1955. The Tea room : Now let us come to the tea room of the 1st arrondissement of Paris. First it is a luxury tea room and so the decoration lives up to that which one expects to find on the iconic Rue de Rivoli. However given the tasty desserts served here and the huge demand for them, the tea room may find itself crowded and lacking for places. So on weekdays one must be ready to wait in a queue to be able to find oneself a cozy place to relish the food. There is also the chance of some typical pastries running out if you happen to be there late in the afternoon. The tea room is open Tuesday to Sunday from 10A.M to 7 P.M. however most pastries are almost over after 5 P.M. so be sure to be there before that. There is also a weekend brunch on Saturdays and Sundays from 11.30 A.M to 3 P.M but it is advised to get a reservation for it. You must also note that the prices for the pastries are different for eating at the tea room and for take away. The price is a bit less when one does take-away so in case you do not wish to wait in the queue or if you do not find your corner in the tea room you can always taste the delights of Sebastien Gaudard but parceling them and trying them out on the benches of the Tuileries Garden just on the other side of Rue de Rivoli. You have the famous French cake called the Mont Blanc made with Chestnut creme (crème de marrons) and meringue. But apart from the clichés I would advise you to try the Paris Brest here. It is an iconic Parisian desert created in 1910 for the erstwhile cycling event called Paris-Brest-Paris. So the dessert is of the shape of a bicycle wheel with praline flavored cream sandwiched between two thin choux pastries. The one at Sebastien Gaudard is probably one of the best versions of this pastry that you will find in Paris. If you are a chocolate lover like me, you cannot miss the chocolate mousse sandwiched between two thin layers of vanilla meringue and covered with chocolate bits. This delicacy is called the Napolitain but you should not confuse it with other cakes of the same name, because this is a unique pastry that can be found only here. Then if you love sweeter pastries you can try the Montmorency with is a vanilla meringue with pistachio covered in nuts. Finally the Baba au Rhum here is worth a try. It is a circular yeast cake (savarin) dipped in rum and was invented in the 18 century by Stanislaus I, the Polish king who was exiled in France, who was also the father in law of the French king Louis XV. Legend has it that during Stanislaus’s stay in Nancy, France, he found the Gugelhupf too dry and thus dipped it in Tokay wine. Much later Nicolas Stohrer, a descendent of Stanislaus’s pastry chef replaced the wine with rum and created the modern Baba au Rhum in Paris. The one at Sebastien Gaudard has its own typical flavor and uniqueness and thus one should try this version of this mythical Parisian dessert. Finally here one can find one of the best Vacherins of Paris. It is a hollow circular cake made of meringue and marzipan, and filled with fruit ice cream. Here you can find the whole cakes but I am not sure if they serve it in parts at the tea room. So here is my list of delicacies to be tried out at Sebastien Gaudard. So next time you are here in Paris, do give it a try and let me know of your favorite pastries from the one of the best pastry chefs this city has to offer.